GREENWOOD, NEBR. 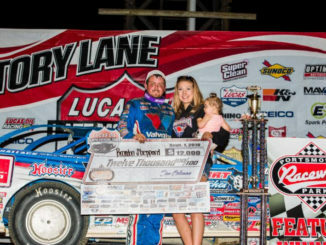 (July 21, 2018) – Jonathan Davenport picked up his second-career, Imperial Tile Silver Dollar Nationals victory at I-80 Speedway on Saturday night. Davenport passed Bobby Pierce for the lead on lap 77 after Pierce began to lose momentum due to mechanical problems under the hood. Pierce’s car ultimately stopped for good on lap 78. Davenport then sailed to the $53,000 victory at the Kosiski Family promoted facility. 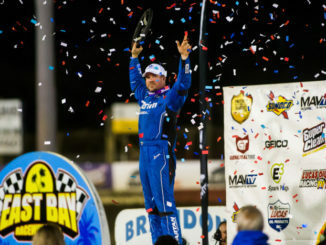 Ricky Weiss settled for second with Jimmy Owens surviving a three-wide battle on the final lap to finish in the third position. Hudson O’Neal and Earl Pearson Jr. rounded out the top five. Owens had a shot at second-place at the end of the 80-lap event but wound up in third. “We had a pretty decent car tonight. I just was riding around the back in the first part of the race. We just got up on the wheel and started running harder. We had a great car. We probably waited a little too long to get to the front,” said the driver of the Ramirez Motorsports, Rocket. The winner’s Lance Landers Motorsports, Longhorn Chassis is powered by a Cornett Racing Engine and is sponsored by: Crop Production Service, Spartan Mowers, Valvoline, ASC Warranty, Penske Racing Shocks, Mega Plumbing of the Carolinas, Midwest Sheet Metal, Sunoco Race Fuels and Hawkeye Trucks. 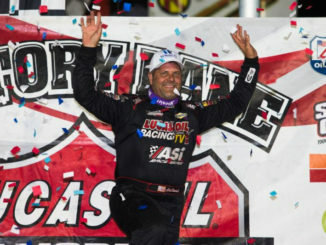 Completing the top ten were Scott Bloomquist, Don O’Neal, Tim McCreadie, Gregg Satterlee, and Chris Simpson. I-80 Speedway – Greenwood, Nebr.